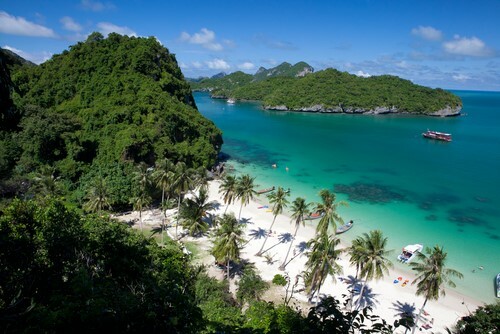 With more than 125,000 inhabitants and being the eighth largest city in Thailand, Surat Thani (often called as “Surat”) is a gateway to the islands of the Gulf of Thailand: Ko Tao, Ko Pha Ngan and Ko Samui. Ferries to Koh Samui depart from the Donsak pier, which is the main pier of Surat Thani, on a daily basis and have a total travel time of approximately 2.5 hours. Visitors also have an option to take combined tickets of bus and ferry from both the Surat Thani Train station and the Airport. With these combined tickets, you can board a bus from the airport or the railway station to Donsak Pier and then take a ferry from there to your destination. Board a bus from Surat Thani train station to Seatran ferry Bus terminal. The bus ride will take not more than 30 minutes to reach Seatran ferry bus terminal. The price you can expect to pay for this ride is around 20 Baht. From the Seatran Ferry bus terminal, you can get your ferry ticket to Koh Samui. This ferry ticket will include the cost of the bus transfer to Donsak pier. It takes around 90 minutes to reach the pier and this is the best time to enjoy the lot of countryside present out of the window. If you are coming to Surat Thani via air, try your best to reach Surat Thani before 4.30 pm so that you can catch the last ferry to Koh Samui departing from Donsak pier. However, if you cannot make it before 4.30, consider having a night stay somewhere near the airport only for the reason that there are not many good hotels and restaurants near the ferry terminal. From the Surat Thani airport, there are buses to take you to the Seatran Ferry bus terminal for around 100 Baht. Alternatively, you can also book a direct taxi to the Donsak pier for around 1000 Baht. There are two major ferry companies operating from Donsak pier that have their ferries terminating at Nathon pier of Koh Samui: Songserm Travel and Seatran. There is a high chance that you will get the ticket on the first one if you are booking from a travel agency. Songserm Travel operates a smaller ferry with two decks that are often very crowded. Seatran ferry is much larger with several decks. It is much less crowded mainly because of its large size. The ferry is equipped with many TVs that mainly run Thai channels. A company named Raja Ferry has its services between Donsak pier and Lipa Noi pier, which is on the west side of Samui (a few kilometers south of Nathon). This ferry features an air-conditioned terrace and comfortable seats. You can consider using this ferry should you decide to come to Koh Samui along with your car. While on a ferry Surat Thani to Koh Samui, you will witness incredible surrounding landscapes with several small rocky islands jutting out of the pristine waters of the Gulf of Thailand. Do not forget to carry your binoculars and cameras! Each ferry carries an average of 200-300 passengers in perfect safety and comfort – well, some ships also offer a massage service on board! When planning to visit Koh Samui, make sure that you check the weather. The rainy season, from September to mid-December, is usually marked by tropical storms and heavy rains. June is ideal for your visit as this is the time when tourists have not yet arrived. The hottest months are from March to May, making winter (December-March) another good travel window to visit Koh Samui.